The Israeli military struck Hamas militant sites in Gaza early Sunday in response to the resumption of rocket fire toward Israel, which threatened to unravel an informal cease-fire that had held since a flare-up of violence last week. Israel has also been battling fires caused by kites rigged with incendiary devices, or attached to burning rags, launched by Palestinians in Gaza that have damaged forests and burned southern agricultural fields. The military said it hit 15 Hamas targets, including military compounds, munition factories and naval forces. The strikes come after militants broke days of calm along the volatile frontier by firing projectiles toward Israeli communities. Israel's Iron Done defense system intercepted some and others landed inside Gaza. Sirens wailed in southern Israel overnight warning of incoming rockets. No one was hurt on either side. Last week, Gaza militants fired dozens of mortar shells and Israel struck back, in the most violent exchange between the two sides since the 2014 war. Police spokesman Micky Rosenfeld said the kites flown from Gaza have caused "widespread damage" to forests and fields in dozens of incidents over the past few weeks. He said planes were deployed the day before to douse the flames. Israel's Channel 2 News said the flying fire bombs have destroyed some 1,000 acres and disrupted daily life in communities near the Gaza Strip. Neither Israel nor Hamas appears interested in a full-blown conflict, and both exercised restraint. Militants in Gaza did not fire long-range rockets at Israel's major cities, as they did in 2014, and Israeli airstrikes were focused on unmanned military targets. Hamas said it reached a cease-fire through mediators, while Israel said it would halt its strikes as long as there was no rocket fire. Any time Hamas or the smaller Islamic Jihad group resorts to firing rockets, they risk triggering a fierce Israeli response, especially if there are serious casualties on the Israeli side. Hamas has also been orchestrating weekly violent protests along the Israel-Gaza frontier. 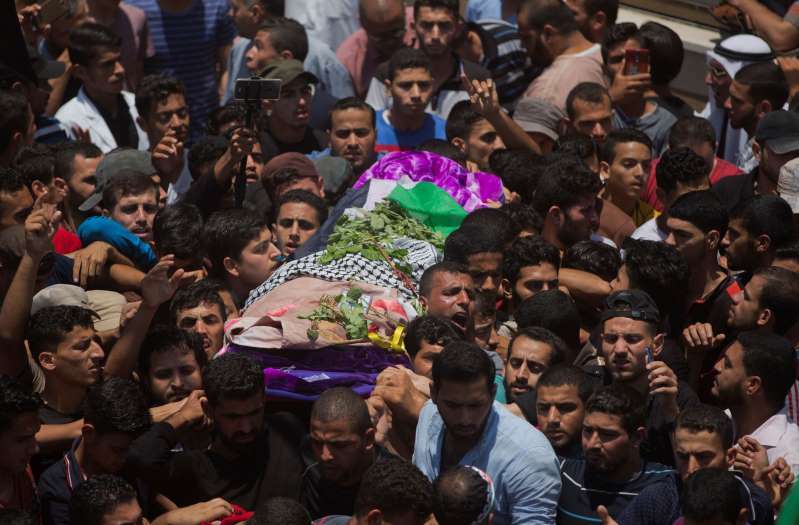 More than 115 Palestinians have been killed by Israeli army fire since they began in late March. On Friday, a 21-year-old volunteer paramedic was shot as she tried to help evacuate wounded protesters near Israel's perimeter fence with Gaza.